A flight for this one. Two flights. 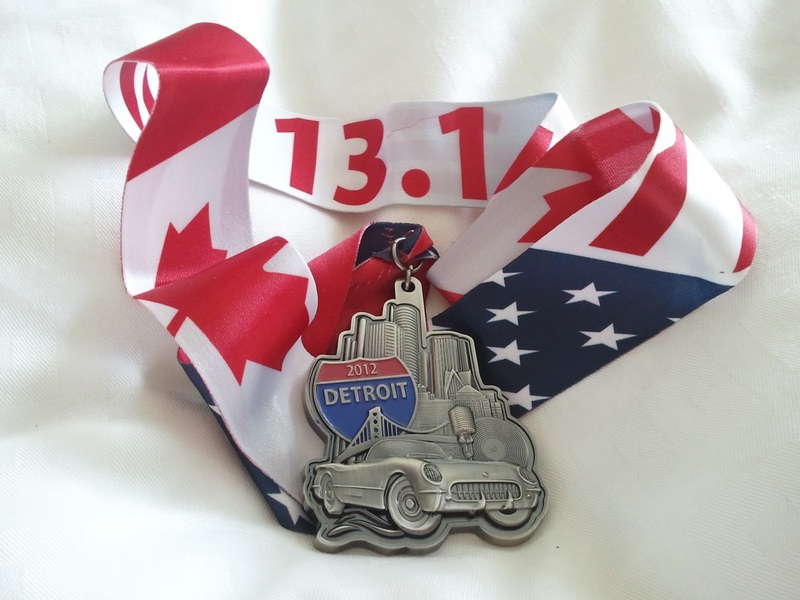 We arrive in Detroit on Friday night in time to collect the car and pick up the race packages at Cobo. It is dark and raining. The Expo is madness with pick-up at the far end. We buy race souvenirs for the first time. Our healthy eating continues into Saturday with lunch at East Side Mario’s with friends then a great sandwich later on at a Greek diner - Plakas. The owner sits at a table with local police. The alarm goes off at 4:45 and our toast arrives with a big pile of butter and jam at 5. Muse are on TV playing a concert somewhere. We get ready in plenty time and hope we won’t be too cold as we didn’t want to do drop off or pick up extra items. I make green tea to take with us to the start for warmth and caffeine. Muse are replaced by The Who and we leave. It is still pitch dark with a light cold wind. We walk out of the hotel and toward the People Mover. There is a small line up but we all get on the first train that arrives. It is not a long wait. I can smell deep heat; people clutch coffee and muffins. There are a lot of headbands and gloves. We are crammed in toward the end; no more people can fit on. We arrive at Cass and Fort to see a huge mass of people below. Time to go. The anthem plays and we separate to find corrals through the masses. Bathrooms are nearby and I find a bin to ditch the tea. Gloves are also ditched before the start despite the cool breeze. Corrals move forward every 2 mins with the blast of an air horn and big bright screens count down each start overhead. I can see the balloons over the start getting closer and at last we are there. It is hard to tell if it is our corral going or the one in front. 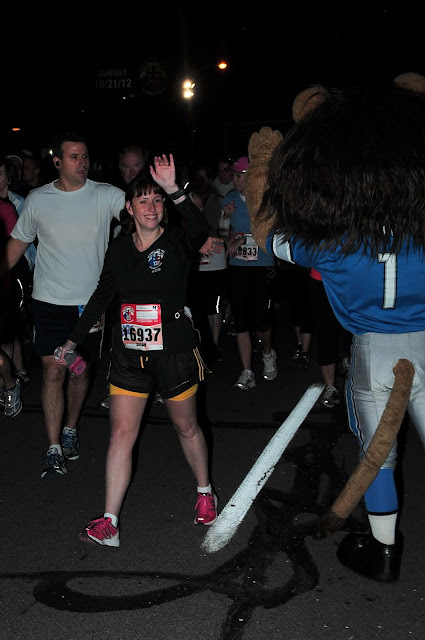 By this time I am at the side and in a perfect position to high five the Detroit Lions mascot before the line. Suddenly we are running, I turn on my Garmin. I weave around dropped clothing. It is busy but everyone has a good pace. 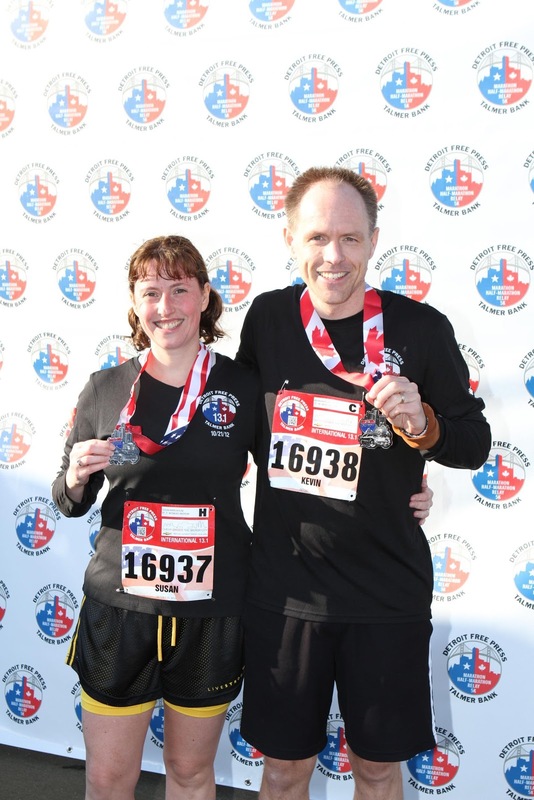 Then there is the best sign of the race – ‘run like a Yankees fan’. We see police off to the side for the first 2k; it seems to be mostly a warehouse district. I look down at my Garmin and see 3 figures which isn’t right – it has frozen somewhere, no wonder my pace is so consistent. I hit stop and start and it picks up from where it froze. I figure I lost 2 mins or so. The bridge looms ahead and then the right turn appears to start the on-ramp ascent. We plod up steadily; a few people drop off and walk as we progress. The view is incredible ahead with runners weaving up all the ramps then across the bridge in the distance. I wish I could stop for a picture but I’m losing enough time on the hill. 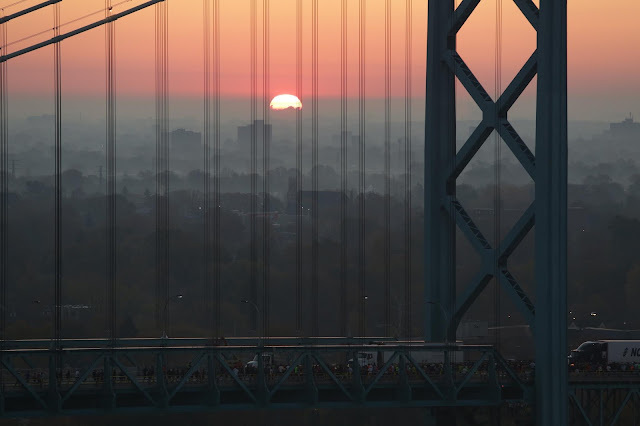 The sun is coming up as we reach the bridge; I run the whole way up the ramps. The guardrail is low and I am running on the far right so I have a great view of the river and the mist on the banks. When we reach the midpoint the climb stops and becomes a descent. I pull out and take advantage for a 5.54 km. The course turns hairpin right and we are in Windsor. This is a great stretch, plenty supporters – including a table with orange slices and a cheerleading team. The view across to Detroit is nice but intimidating as it shows just how far we have to run to get back over. I have a gel pack and get water from the station. As we pass 10k my watch shows 0.59. A lot of supporters have gloves and hats on but I am quite hot by now and roll up my sleeves. It gets even busier near the tunnel and a radio station is out playing Psy rather loudly. This is nicely distracting from the race. I discard the remains of the gel pack and we start down toward the tunnel entrance. It is hot and humid in there but easy going on the downhill portion. As we pass the midway flags back into the US the ascent starts. I know from the drive that it is almost over at the 30 speed limit sign but it is still hard to get up the hill. The fresh air is nice and there is a large crowd at the top. The ‘welcome back to the USA’ sign is at the top of the hill, I jump up to touch it along with a couple of other people. I high five some kids who are out watching which gives me a boost and I have a fast 2k. We head toward the Joe downhill. There is a band here and everyone is waving. We forget there is 7k to go as we have already done ‘the hard parts’ of the bridge and tunnel. There is also a giant inflatable something and a clown? I use the camera for the only time on the run and take a pic of the Joe as we pass. 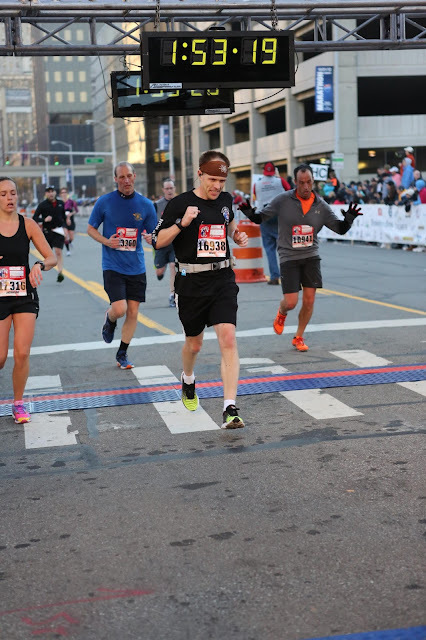 I catch the 2:15 pacer here but they weren’t supposed to have started in my corral, it should have been the one in front. I think I am ahead of my 2:15 goal time. The next stretch begins with a climb onto an overpass; I wasn’t expecting more hills and have to walk. A lot of people stop on the route through Mexicantown to stretch, tie laces or have M&Ms which are being given out by happy people at the side. I really want to stop but can’t, I know I am losing time. Some of the street signs are in Spanish. We see another water station and there is a band that isn’t playing as we pass. Really? YOU need a break? Another hill appears and my feet start to really hurt. It is hard to keep it going; I need fuel but can’t make the connection. A lot of people are out on their front porches on the next stretch, it is a beautiful leafy neighbourhood – Corktown. One lady is playing Eye of the Tiger on a huge speaker system, drowning out a band further up the road. A group (students?) have beer and appear to be having a party. The sun is now quite warm. At 20k I manage to pick it up somehow, running in 30 secs faster than the same stretch in Edmonton. We are back in downtown, then at the roundabout, then in sight of the finish line balloons. A lot of people are out with signs, I see people sitting in the Coney watching and quite a few runners who have already finished. Right before the finish a drain is emitting a big cloud of steam in traditional Detroit style. 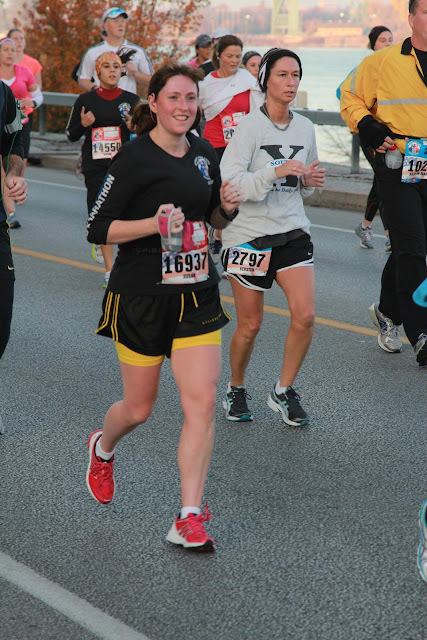 It is all I can do to smile as I cross the finish line. Arm raising is beyond me. I get a bottle of water after the line then collect my fabulous medal. It isn’t crowded at all. Someone gives out space blankets so I pick one up then a few minutes later find Kev waiting in the finish chute. We take some pics then line up for food – organic Tru Moo chocolate milk! There is another line up and we discover this is for photos being taken by the official group. We wait for that even though it is chilly out of the sun and Kev is vibrating. It is time to get back to the hotel. 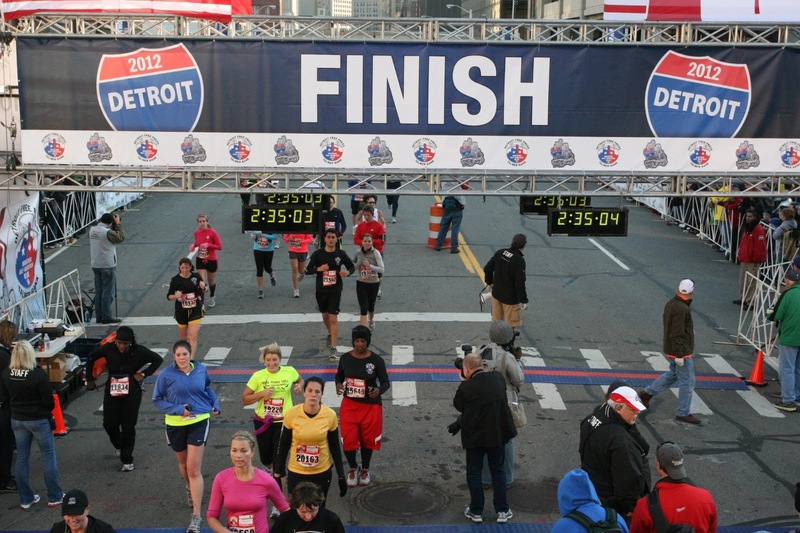 The route back to the People Mover station is a few blocks as we can’t cross the finish area. It isn’t busy and we get a train right away. We pass Comerica where policemen on board start talking about the upcoming World Series. We get off wrapped in our blankies and take the inside route back through a nice cozy casino. The sun is shining and the sky is blue. We wait until the official times come out a few hours later, although my watch said 2:14 at the line it was actually 2:18. A new PB but not my goal time. Kev beat his PB by 6 mins! A great race for him. Then we head for Pizza Papalis for gallons of diet coke and pizza. The medal comes too.